How to think of giving as a daily endeavor. 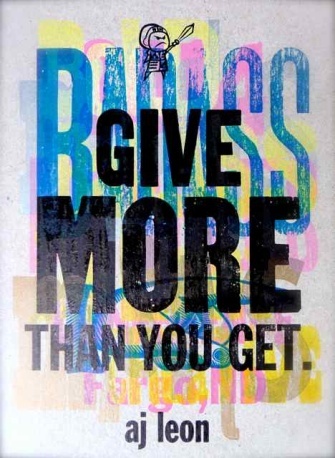 Give365. For at least the next 365 days, I am inspired. I just spent a few days in Fargo, North Dakota attending #Misfitcon. A small handcrafted event for creatives, misfits, and troublemakers who want to make a dent in the universe. I had the opportunity to meet people who are making an impact in places like Lao, Sudan and here in the US. One thing they have in common is they are doing this creatively, through music, film, coffee, food, art, words, education, technology and ideas. This was the second #misfitcon. The gathering is overflowing with what I would call intense sharing from 8am often through the night. The agenda is secret, speakers are unknown until they get the mic. Then WOW. There are no big stages, meeting tracks, apps, live streams or published schedule. No one is looking at their laptop or smartphone. The lights don’t dim, they go up in 500 colors. Much like Fargo, the group is small, creative and um…… different. Unlike many conferences, where you pour yourself back onto a plane suffering from SXSW Flu or CES Tech overload, I came back from Misfitcon tired but energized and inspired at the same time. Last year was the first Misfitcon. I walked away motivated to create every day. For the first time It didn’t matter how good or bad my writing, photography, or art was. It was time to stop waiting for permission or approval. This year, the creative message was powerful but I walked away with something even more substantial, to give every day. I’m calling it Give365. I’m sure that name is taken, but it doesn’t matter. What matters is that it helps me remember to give something away every day. This story, and my fellow Misfits, really got me thinking about what we all have to give. It got me thinking about how often I forget to give. You see, outside of charitable donations and other good causes a few times a year, we often forget to give. Sometimes giving is automated, charged to our credit card or automatically withdrawn from a paycheck as a line item and deposited with a large corporate concern. [Read more…] about We Forget to Give. Rituals, Habits, and Routines. How history's greatest thinkers created brilliant work.